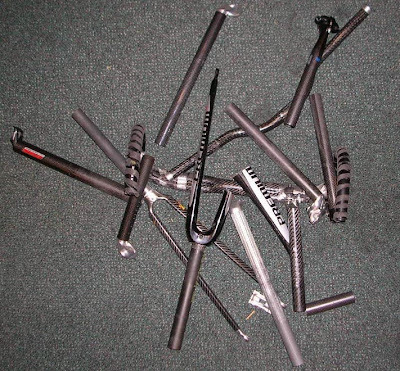 I don't know how you break both sides of your bars off. Not from any normal crash. 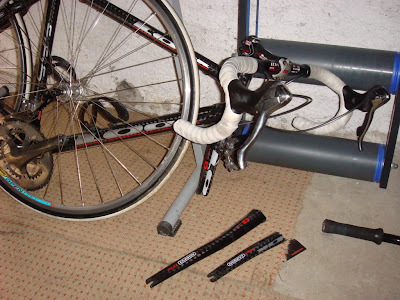 Once again, the steerer breaks. 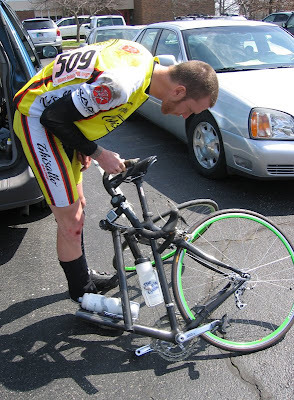 I'm guessing a crash in a race, judging by the number on the bike. Tinker Juarez got hit by an opening car door while doing about 22 mph. 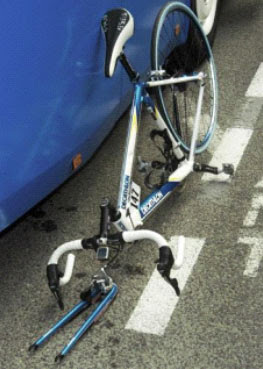 He's ok, but his bike isn't. 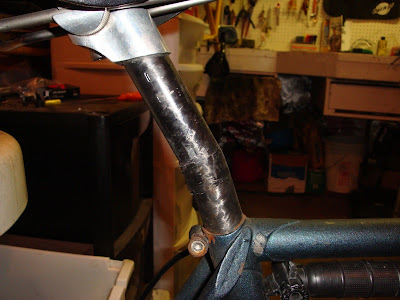 4 inch crack in the top tube. The complete story is on his blog. 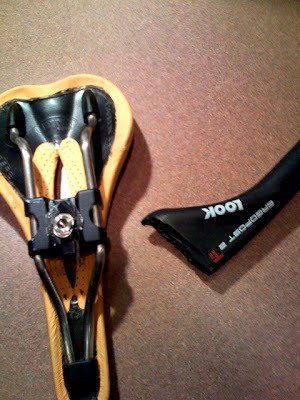 Oh my, another broken Look. 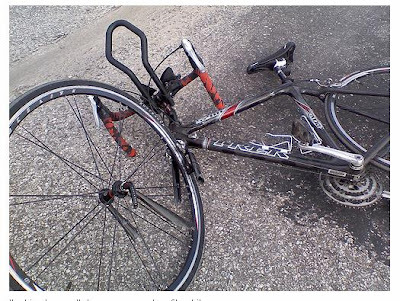 Crash happened descending the Tourmalet when I misjudged a corner. Ended up going into a ditch as the 'safest' option. 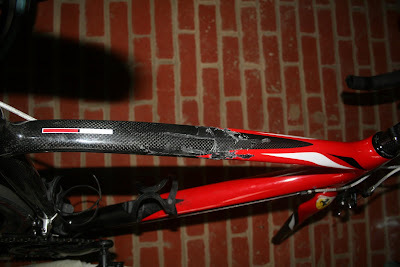 Front wheel hit the end of the ditch, ripped the wheel and forks off and I did a forward roll over the bars. Walked away without an injury, the bike needed a bit of work. Wow, glad you are ok. The bizarre angle of the bars makes this look like the result of a crash. The Look frame appears to be ok, which is good news. 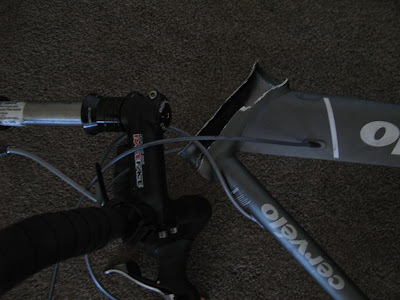 The issue here is that the frame is now in two pieces. 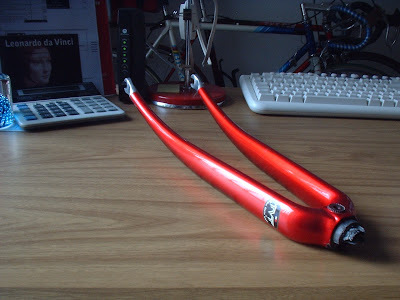 After a crash resulting in a broken steerer, this fork found a new life as a desk ornament. 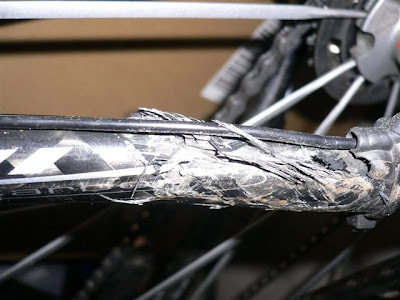 This racer tried to sneak a right turn in at full speed, got his wheel caught under a pickup truck's tire, and snapped his carbon fork. I heard it from a block away and went back to help. He was dancing around in pain. Spectators were telling him he was in shock. He said, I'm not in shock. I'm in pain. This bike was on a trunk mounted bike rack. Roof racks and garages must be the #1 killer of bikes, truck racks is probably a close second. Mountain bikers want in on the fun too. 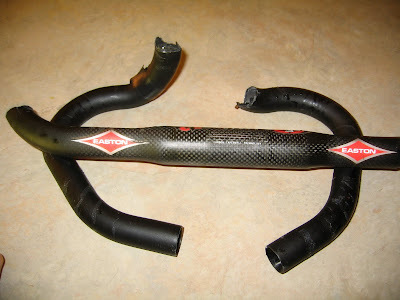 Broken carbon bars aren't just for roadies. This isn't carbon, but I'm posting it anyway. 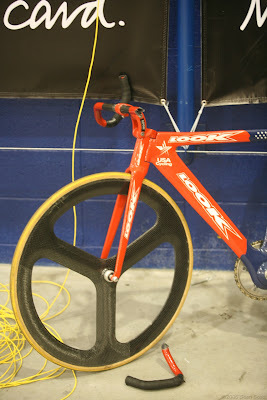 It's from a thead on bikeforums.net. 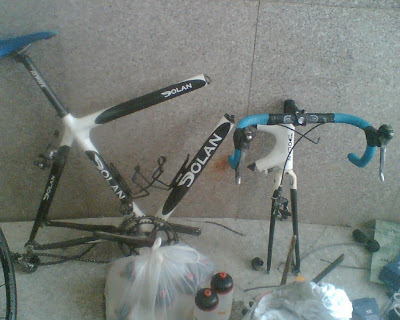 Please take a look at the attached picture where my bike frame broke (I am not going into the details of how this happened). Is this covered by the warranty? How do I go about getting this fixed? 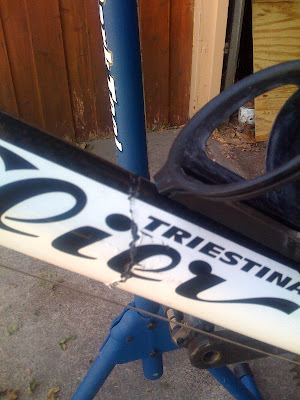 Will I need to buy a new frame? I'm not sure what he did to break his frame like this, and he's not saying. 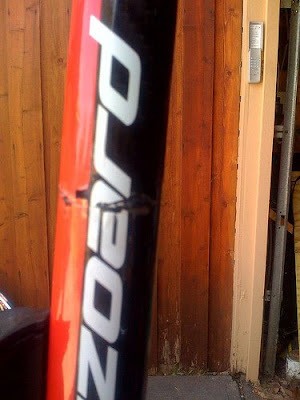 However, I'm pretty sure that Cervelo won't be replacing it for free. This time it's a Felt that has lost it forks. Thanks to Stuart for this one. When a Fuji and a Land Rover meet at a 4 way stop, and the Land Rover doesn't stop, the Fuji loses. 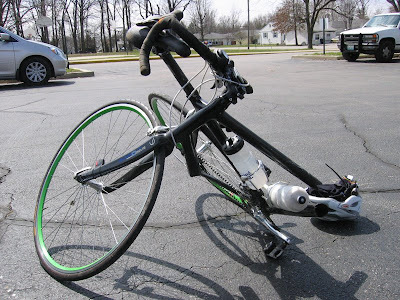 I've been getting a lot of traffic from Tritalk.co.uk so I thought I'd post a tri-bike. 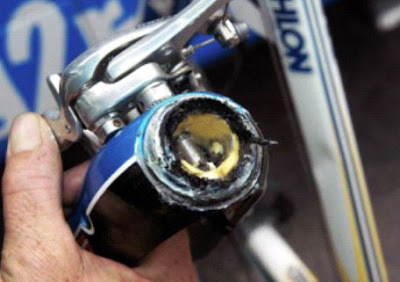 It's not just the roadies who are breaking their forks. 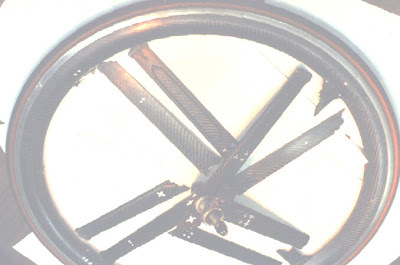 It looks like the carbon fork blades popped off of the crown. 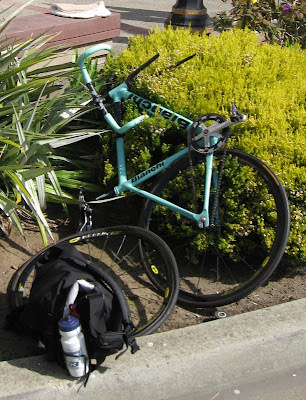 It doesn't appear to be a problem however, since a fixed gear bicycle without a front wheel is just a unicycle. I don't know the full store behind this one, all the owner is willing to say is "car, wife and solid object = dead BMC." Such a beautiful bike, such a waste.